But, if you play it smart… you can still find a quiet corner to get some alone time & some awesome photos with the ancient ruins. 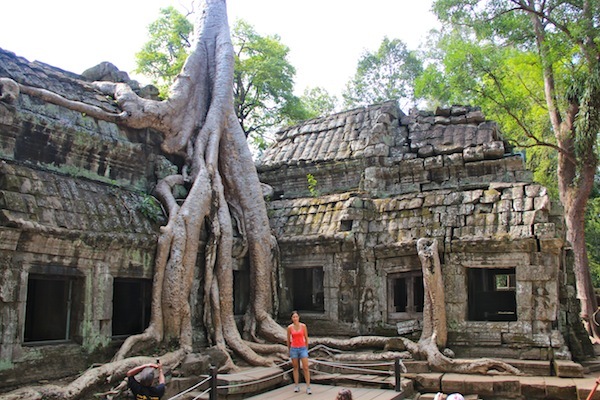 After spending waaay more time than we had planned for in Phnom Penh… we jumped on a bus headed for Siem Reap, eager to explore the world famous ancient stone monuments of Angkor Wat. The thought of wandering around the 12th century ruins of an ancient civilisation had me drooling so bad – people were offering Anna condolences & asking if I would ever fully recover from my stroke. Angkor Wat is by far the most famous monument due mainly to it’s scale. 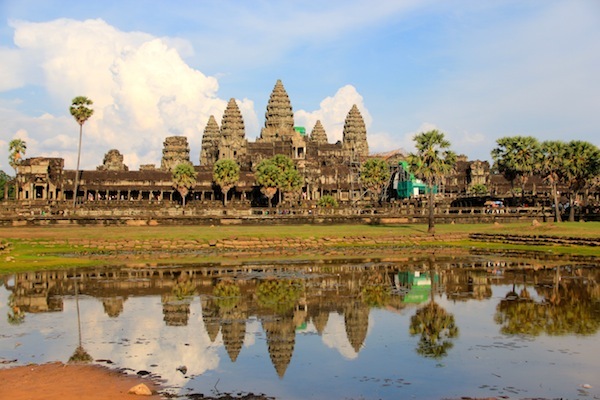 Another popular misconception about Angkor, is that it was purely a temple built for the Hindu gods… in reality Angkor Wat was a thriving city, constructed by the Khmer Kings of old. There are other smaller, yet equally impressive ruins inside the park besides Angkor Wat… the clear standout for me was Bayon. Out in the forest not far from Angkor Wat, Bayon is made up of no less than 216 giant stone Buddha faces… wherever you go at Bayon, you cannot escape the serene gaze of an enormous Buddha’s eyes. … they can also be an intimidating & constant reminder that you’re never alone at Bayon, like you’re constantly in the presence of much older, wiser beings than you’ll ever be… you dummy! 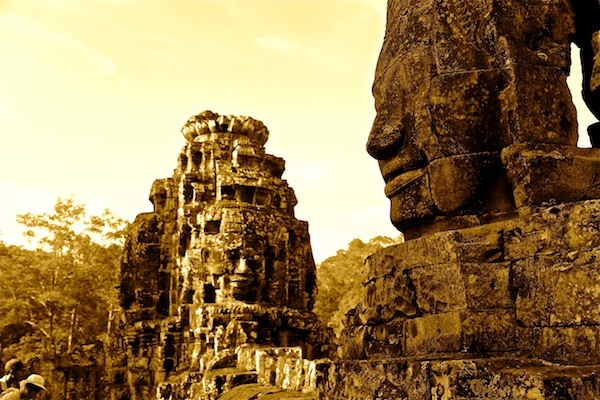 The best time to visit Bayon is sunrise or sunset… when the sun casts shadows enhancing & bringing the stone faces alive. 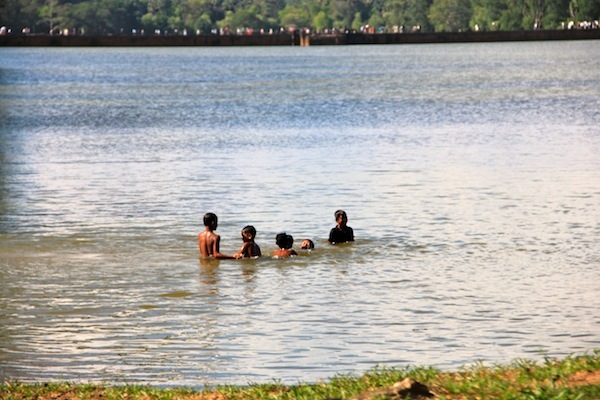 … these days the local children use the ancient moat for swimming… splashing around to cool off during the peak of Siem Reap’s blisteringly hot days. … this allowed us to drive straight into the park early the next morning – when the masses were still lining up to buy a ticket. We arranged to meet our driver early the first morning, with the hope of enjoying a stunning sunrise over Angkor. 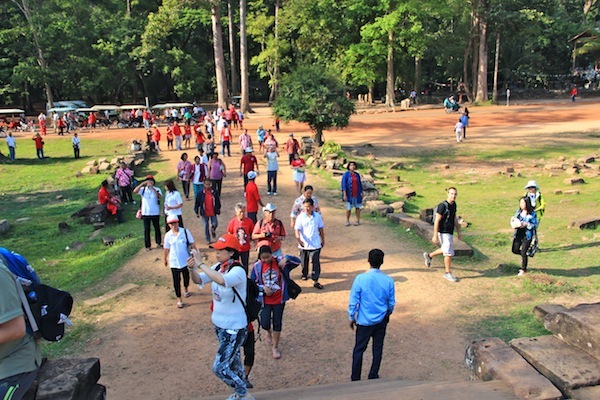 After dragging ourselves out of bed at 4am… it was still dark when we walked through the gates & into the park to join the small crowd of committed tourists & amateur photographers that had gathered to greet the sun as it rose over Angkor Wat. 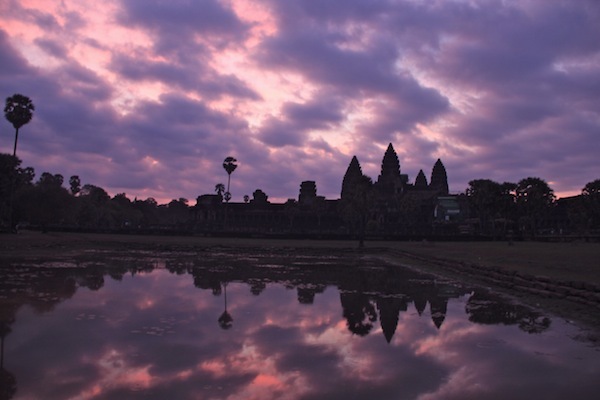 We managed to snap a few sunrise shots and then left Angkor Wat immediately – headed for Bayon. 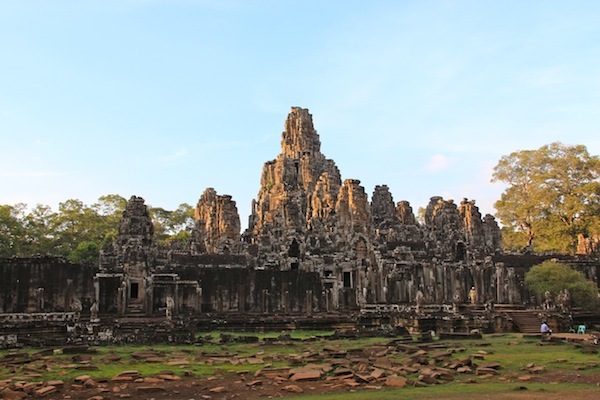 Our plan for the first day – started with sunrise at Angkor… then hot-footing it straight over to Bayon to get some quiet time there, while the masses were still scurrying around Angkor Wat – then seeing what we could of Angkor Thom before heading back to our hotel for the day. This strategy worked perfectly… we got maybe a full hour at Bayon, sharing it only with 15 or so other savvy tourists who had worked out how to dodge the crowds. The real kicker came as we were leaving Bayon… and a 50 seater bus pulled into the car park and flooded the ruins with tourists. What We Managed To Avoid... Aren't We Clever? … they loom above you – like the entrance to an Ancient World, as though you’ve been fortunate enough to be permitted to pass through to spend a few precious hours with a forgotten civilisation that has been cut off from the modern world & only recently rediscovered. … venturing back out to explore the ruins further when the bite has eased from the sun in the late afternoon. This is pretty much what we did too… it gets blistering hot after midday in Siem Reap… you can feel the heat bouncing off the huge solid stone walls that engulf you as you clamber over & around the different ruins. Before retreating to our hotel pool for the afternoon though, we made sure we included a stop at Angkor Ta Prohm to get our Tomb Raider shots. Made famous by the Tomb Raider film (should ring some bells) – Ta Prohm is home not only to ancient ruins but, also to huge trees that have grown right out of the stone ruins, the tree roots have twisted and intertwined themselves with the stones over the years to eventually become one with the ruins, inseparible. As you can imagine, it’s a popular spot for tourist photos… so a long wait can be expected. 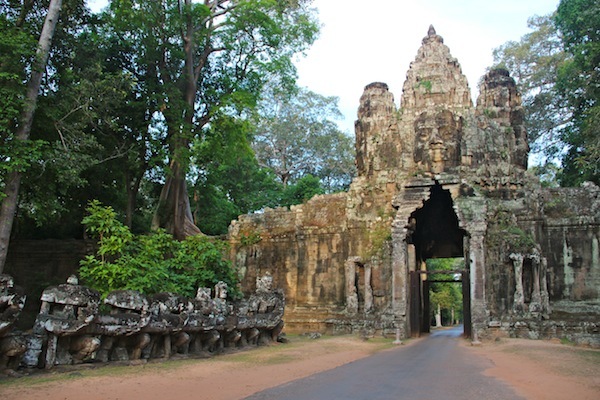 We left our return to Angkor Wat until the 3rd & final day of our pass, taking a right turn just before passing through the front entrance gates to see the impressive statue of Vishnu… the god with 8 arms hidden inside the far entrance gate. Venturing inside in the hot afternoon our clothes clung tightly to our skin from the sweat & humidity. The staff inside Angkor were busy pouring water all over the stone floors… presumably to help take some of the heat out of the stone, but effectively creating a sauna like environment. We thoroughly explored Angkor Wat from head-to-tail not expecting to ever be back inside these great walls. Sadly, thieves have plundered many of the ruins over the years… cutting out pieces of Angkor to sell to private collectors who are willing to part with a lot of money to own a piece of Angkor. It’s blindingly obvious as you wander around the ruins what the thieves have targeted… mostly you’ll notice heads crudely hacked off statues. 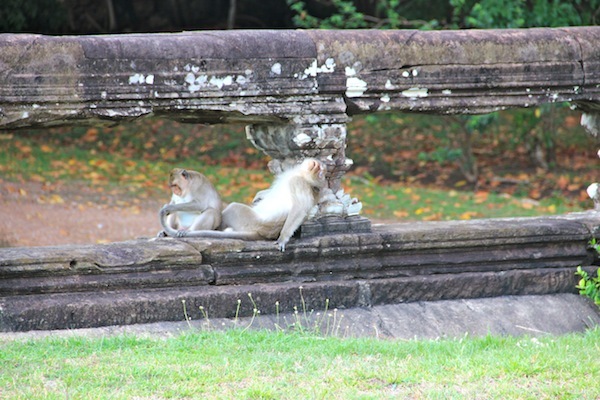 Surprisingly if you’re willing to do a bit of walking, you can find a quiet corner of Angkor Wat. If you’re determined enough to hang around during the hotter parts of the day – when a big chunk of tourists are snoozing in their hotel rooms – you’ll find very few other people have the commitment to explore the very farthest corners of the huge monument. … once inside, underneath the huge centre spire – the largest of all 5, you’ll find a single stone Buddha statue. You Thought Your Job Was High Pressure... 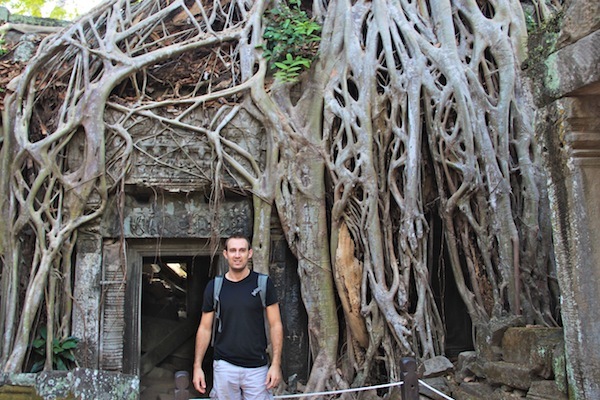 Try Being The Centre Piece of Angkor Wat! 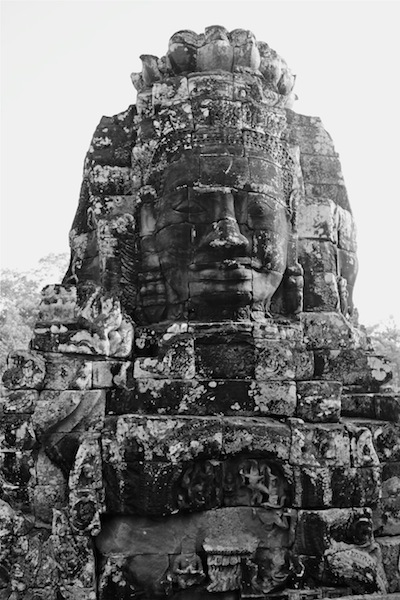 Now every time I see a doco or a photo of Angkor… I’ll think of the lone Buddha that has the distinct honour of being the centre piece of that enormous structure. The view over the park from the top is impressive. 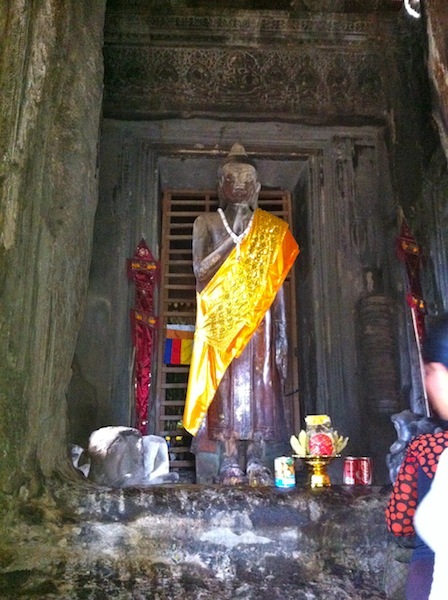 Note – Like all Buddhist temples your shoulders and knees need to be covered to get inside the centre spire. 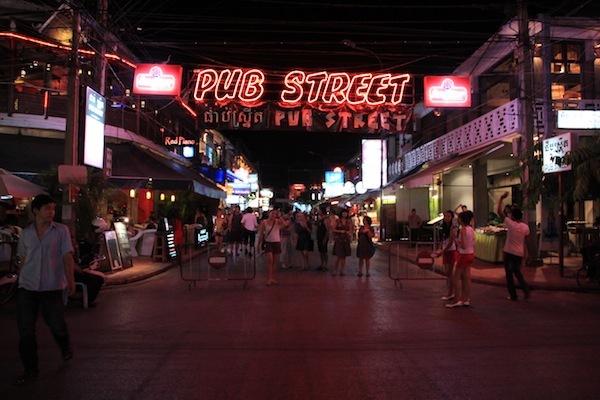 As you would expect there are a ton of options for eating and drinking in Siem Reap… Pub Street is a popular choice, with a range of local Khmer & western restaurants. 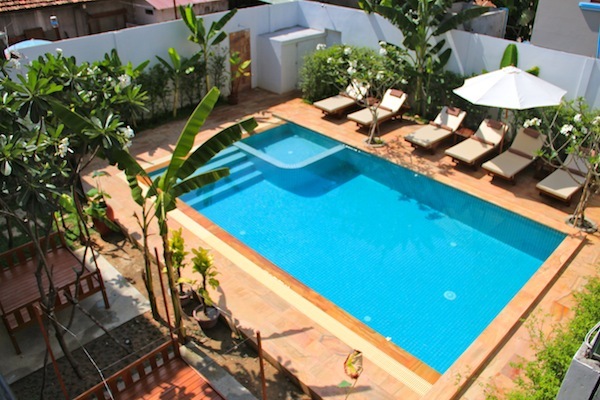 With a swimming pool and amazing staff who arranged a Tuk Tuk for us so we could explore the ruins over the next few days. As fate would have it, it was at this hotel, I discovered my new favourite drink… a rockmelon shake that was complimentary upon arrival and 110% delicious (and I’m not even a fan of rockmelon). The drink wasn’t on the drinks menu… so I had to make a special request to get one of these bad boys everyday with lunch. We took a bus from Phnom Penh – stopping to spend a night in the small town of Battambang & ride the bamboo trains… before continuing our bus journey to Siem Reap. 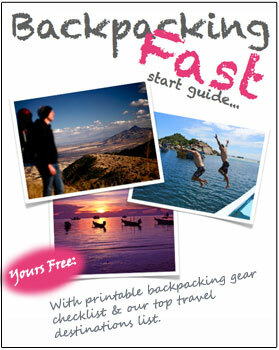 Tuk Tuk – the most practical and affordable option. … it’s strenuous enough climbing up, down, & around the ancient ruins all day in the stinking heat… let alone riding a push bike from ruin-to-ruin on the dirt roads. Rumour No 1. 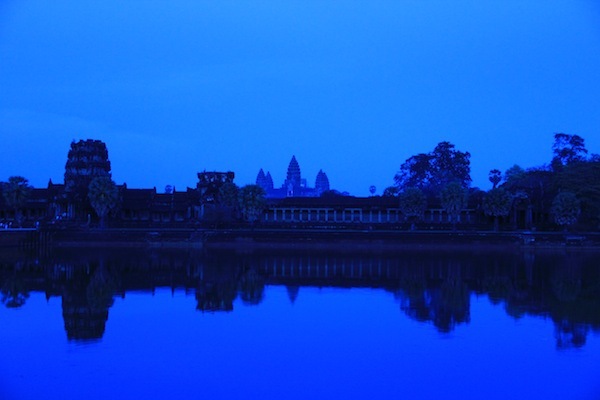 Angkor Wat is only 1 monument… you pretty much go to see Angkor Wat, then you go home. 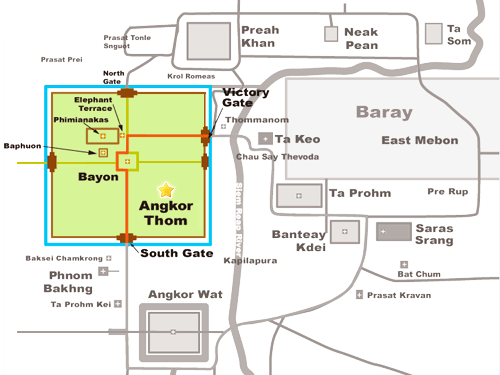 The Truth: The Angkor Archaeological Park is made up of over 1000 stone monuments… arguably, some of the other monuments are even more impressive than Angkor Wat. 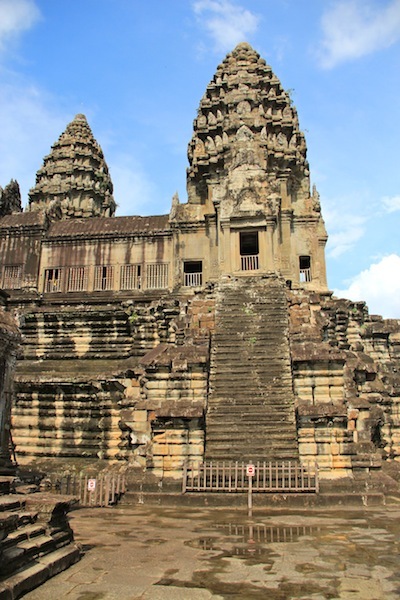 The Truth: The truth is – the Khmer (Cambodian) people never forgot about Angkor… in fact it’s been the source of a lot of tension over the years between Cambodia & it’s close neighbours.